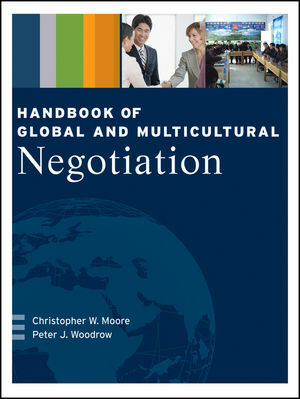 Handbook of Global and Multicultural Negotiation provides advice and strategies for effective cross-cultural negotiations. Written from a multicultural perspective, this guidebook explores cross-cultural communication for problem solving and negotiations. This resource includes real-life stories and examples compiled from over thirty years of domestic and global experience from both authors, including Chris Moore, a well-known international negotiator and best selling author. This step-by-step guide to negotiation provides practical recommendations, advice, and globally proven strategies to promote coordination and agreement making for mediators, facilitators, business professionals, and lawyers. Christopher W. Moore is a Partner of CDR Associates an international collaborative decision making, conflict management and dispute resolution system design firm based in Boulder, Colorado. He has worked in the fields of international negotiation, multi-party decision-making and conflict management for over twenty-five years. He is an internationally known mediator, facilitator, dispute systems designer, trainer, and author in the field of conflict management. He is the author of The Mediation Process: Practical Strategies for Resolving Conflict (Jossey-Bass Publishers, 2003 3rd Edition), and numerous other journal articles and manuscripts on international, ethnic, natural resource and water conflict management. Peter J. Woodrow is the Co-Director of the Reflecting on Peace Practice Project at the CDA Collaborative Learning Projects, in Cambridge, Massachusetts. He is also on leave as a Partner of CDR Associates in. Woodrow is an experienced mediator, facilitator, trainer, and consultant. Woodrow is skilled in negotiation, collaborative problem solving, team building, dispute systems design and conflict intervention. He has mediated and facilitated multiparty environmental, organizational, and public policy disputes and has? also developed and implemented international programs in consensus building, problem solving and decision making in Asia, Africa, and Eastern Europe. He is the co-author of?several books, numerous monographs, and articles about negotiation, dispute resolution, and peace building.